Dakota Jones parted ways with the United States Army three years before he was due to retire and spent some time with a Ranger buddy in Australia, but now he is ready for an overdue visit with two of his siblings who have settled near Timberlake, Colorado, his older brother Cal (What We Find) and sister Sierra, the youngest of the four Jones siblings (Any Day Now). All of the siblings reacted differently to their schizophrenic father and their unusual upbringing. Dakota’s response was to escape as soon as possible. He left home as soon as he graduated from high school, enlisted in the Army, and has visited his parents only four times in the years since. Although he has remained independent of his brother and sisters, the bond they share has endured long separations and distance, physical and emotional. He is ready to spend some time with them, although he expects his stay to be relatively brief. But a few days turns into a few weeks. Dakota likes the place and its people, and his time with family is unexpectedly satisfying. Soon he has a job, a rented cabin, and no departure date. There’s no shortage of women interested in Dakota, but bartender Sidney is the only woman in whom he is interested. The more he knows about her, the more interested he becomes. But Sid is hardly the simple bartender that she seems to be, and the baggage she carries makes her wary of men and distrustful of her own judgment. The chemistry between her and Dakota is undeniable, but neither is sure they have a future together. This third novel in Carr’s Sullivan’s Crossing series may focus on the third of the four Jones siblings, but Dakota’s story is only part of the book. Cal and Maggie with baby Elizabeth and Maggie’s father, Sully, are much in evidence. The whole family gathers for Sierra and Connie’s wedding, and the couple’s life provides a plot thread, as does that of the number two sibling, Sedona. Fans of the series will also be pleased to see further development in the romance of handyman Tom Canaday and Lola Anderson. In addition to the theme of family indicated by the title and exemplified not only through the Jones family but also through Sid’s relationship with her brother and nephews and through Tom and Lola’s blended family, mental illness is a recurring issue. It is only as Dakota reaches thirty-five that he believes he has escaped inheriting his father’s illness, Sierra fears passing the illness on to children, and Sedona’s struggle is the most painful of all. Sid’s history includes a breakdown, and a minor character who is a sociopath. These multiple threads keep the reader invested in the story. Nobody mixes family and community dynamics with romance better than Robyn Carr. She gives her readers layered characters whose voices ring true and places them in rich contexts with stories that are engaging and authentic. 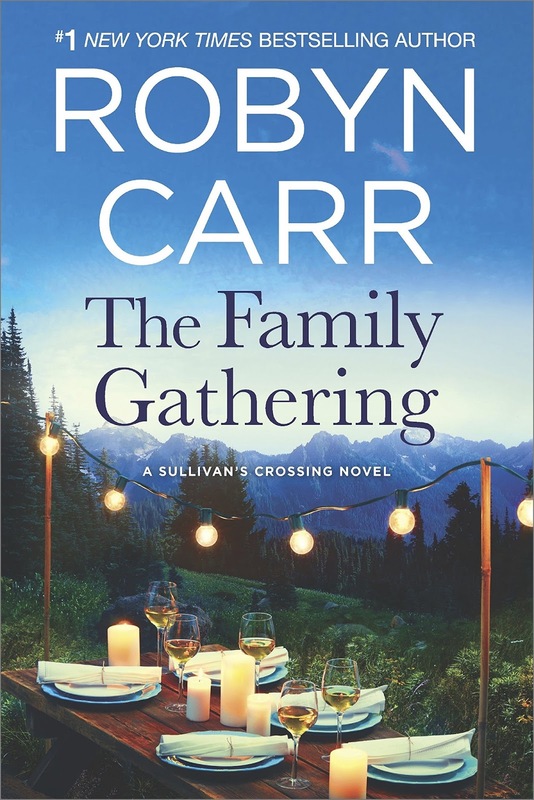 There is so much going on in The Family Gathering that some readers may feel overwhelmed at times, but Carr’s devoted fans will feel at home with the family in Colorado and look forward to the next visit. I love this series and can't wait to read this book! I love this series and can't wait to read this one. I want to read this book soon it sounds so good. I love Robyn's books.